The way retailers distribute their products—and the way consumers purchase them—has been largely unchallenged for many decades. But, with the rise of digital-born, micro-brand retail companies, it’s becoming clear that the traditional way of doing business is beginning to face serious disruption. The way retailers distribute their products—and the way consumers purchase them—has been largely unchallenged for many decades, resulting in massive market consolidation that has left a handful of big players to dominate most industries. But the retail market is starting to change dramatically—both in the way products are distributed, and how they are sold. With the rise of digital-born, micro-brand retail companies, it’s becoming clear that the traditional way of doing business is beginning to face serious disruption. According to Retail Dive, seven large retail corporations filed for bankruptcy protection in the United States during the first five months of 2018. Many of these bankrupt businesses were those that depended on malls or department stores, and were particularly susceptible to online giants like Amazon. These eCommerce behemoths are able to offer on a large scale the ease of purchase that today’s consumers increasingly prefer. Consumers’ shifting behaviors might seem alarming, but they actually present an exciting opportunity. New, widely available commerce technologies are enabling brands to directly reach their customers—be they traditional consumers or B2B buyers—effectively bypassing traditional channels. Now, business owners and brands can easily enter new markets and scale in ways that simply weren’t possible before. 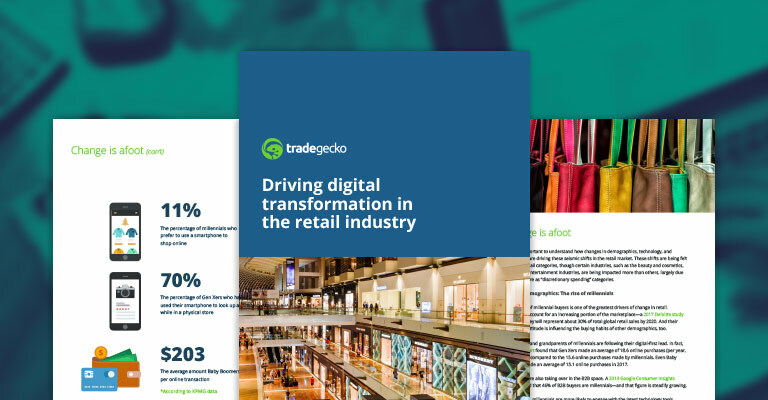 Download our eBook: Driving digital transformation in the retail industry to understand what's causing these market shifts, the implications for your business and how to fearlessly transform your business into one that embraces automation and growth. Download our latest ebook to learn how to fearlessly transform your retail business.